A California lawmaker has proposed a ban on keeping killer whales in captivity for purposes of human entertainment. Announced today by Assemblyman Richard Bloom, D-Santa Monica, the Orca Welfare and Safety Act would outlaw SeaWorld-style shows, as well as captive breeding of the creatures. Violations would be punished by $100,000 in fines, six months in jail, or both. No hearing has yet been scheduled on the proposal, which will require a majority vote to pass through legislature. It’s also unclear how much support the bill will have, though California has passed progressive animal legislation in the recent past, including bans on shark fin soup and hunting bears with dogs. Bloom’s proposed law isn’t the first of its kind: South Carolina banned the public display of dolphins in 1992, as did Maui County, Hawaii in 2002. In February of this year, New York state senator Greg Ball introduced a bill that would ban orca confinement in sea parks and aquariums. 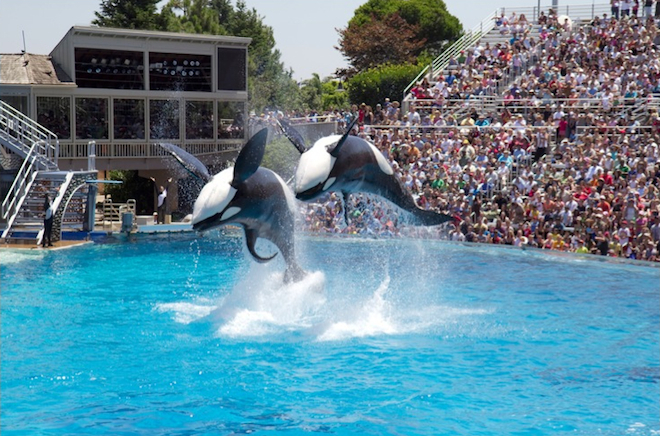 Unlike those states, however, California is home to SeaWorld San Diego, where 10 orcas — roughly one-fifth of all captive orcas — are used in performances. “This is a huge state in which to have that ban,” said Lori Marino, a neurobiologist and founder of the Kimmela Center for Animal Advocacy. In recent years, the experience of captive orcas has come under scrutiny by animal advocates and some scientists, who say that aquarium conditions are simply inappropriate for animals as big, intelligent and highly social as orcas. As evidence, advocates point to the physical and mental problems of orcas in captivity: They’re short-lived, prone to disease, have difficulty breeding, display extreme aggression and in some cases appear to be emotionally disturbed. Such was the case with Tillikum, an orca at SeaWorld Orlando who killed three people, including SeaWorld trainer Dawn Brancheau. Her death and SeaWorld’s orcas were the subject of Blackfish, a 2013 documentary that inspired Bloom’s measure, which was written with assistance from Blackfishdirector Gabriela Cowperthwaite and Naomi Rose of the Animal Welfare Institute. Koontz said the bill reflected the “the same sort of out-of-the-mainstream thinking” as an infamous lawsuit, filed by People for the Ethical Treatment of Animals and dismissed in 2012, which invoked the United States Constitution’s slavery-abolishing 13th amendment as grounds for freeing SeaWorld’s orcas. “We engage in business practices that are responsible, sustainable and reflective of the balanced values all Americans share,” wrote Koontz. Andrew Trites, head of the University of British Columbia’s Marine Mammal Research Unit, said that misgivings about keeping whales and dolphins in captivity are not restricted to activists and extremists. They’re something many scientists grapple with. Marino noted that the bill allows research on orcas held for rehabilitation after being rescued from injury or stranding. Those orcas couldn’t be kept in aquariums, though, but rather in enclosed, shallow-water sea pens that are open to the public — a compromise, perhaps, between greater-good benefits and individual well-being. Orcas now kept at SeaWorld would be returned to the wild or, if that’s not possible, also kept in sea pens.